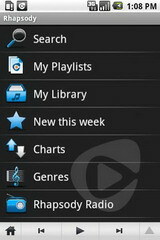 Android users using Android-powered handsets like the Motorola Droid or Google’s Nexus One can now explore and stream Rhapsody’s entire catalog of over 9.5 million songs from pretty much anywhere. Using the app requires a Rhapsody subscription ($10 per month), but anyone can try it free for seven days. You can download Rhapsody from Android Market on your phone and by searching for "Rhapsody." Download the app and try it free. 0 comments on "Rhapsody available on Android Market"